Digitise data collection, improve data quality and automate complex research protocols. Improve your team's ability to collaborate and communicate. Monitor and supervise field activities centrally. 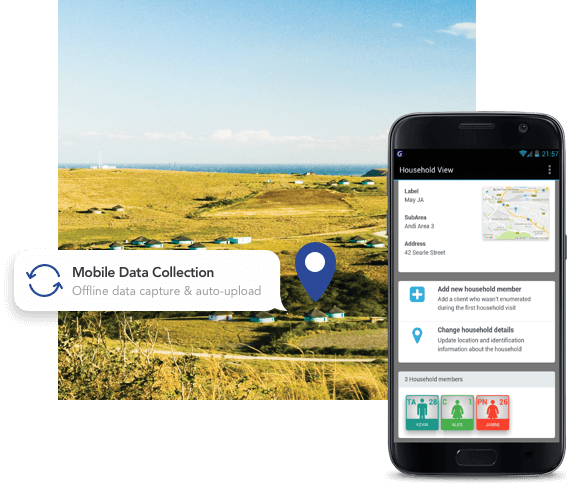 Review, clean, analyse and export data from the field in real-time. Share live reports and dashboards with funders and key stakeholders. 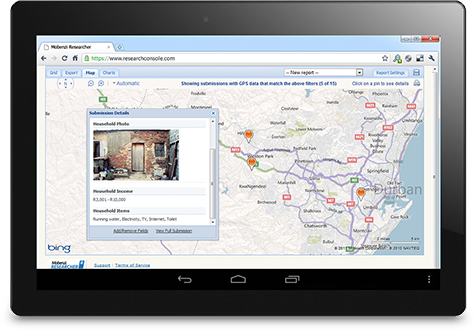 We enable organisations to measure and maximise their impact by digitising their fieldwork. Since 2007 we've worked alongside leading organisations to scale their impact through thousands of frontline workers in over 50 countries. 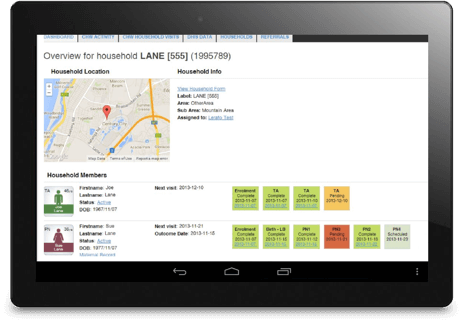 Frontline workers want a simple, trusted interface which consolidates all the functionality, content and data they need. That's where Mobenzi Gateway comes in. Rapidly configure solutions which package everything your frontline workers need (and nothing they don't). Leverage pre-built mobile plugins and templates to cater for common use cases. Need more sophistication? Gateway can link in third-party apps and seamlessly integrate custom-built modules which can skip the heavy-lifting around caching, version control and data synchronisation. Paper-based data collection is riddled with inefficiency and rigidity. Errors can be introduced at multiple points and the data processing cycle is notoriously slow. Design and publish forms and surveys to frontline workers in minutes using the Mobenzi Researcher plugin. 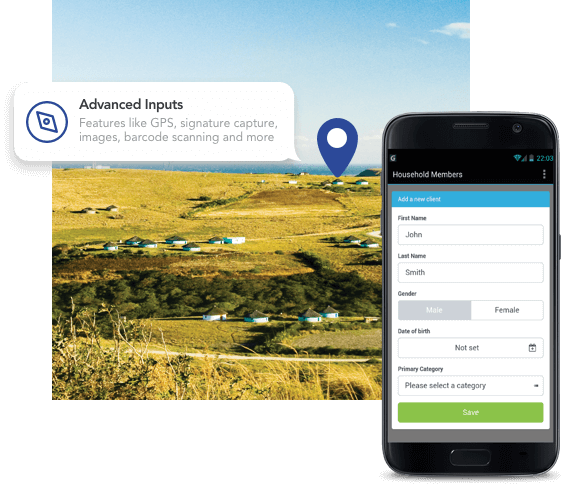 Streamline data collection and ensure data quality using validation, logic and advanced inputs - even when offline. Need even greater flexibility? Our platforms support bespoke data entry screens or integrate your preferred app. Frontline workers are often faced with the daunting task of managing hundreds of individual clients, patients or beneficiaries over long periods of time. Each case has information which needs to be captured, referenced and maintained. 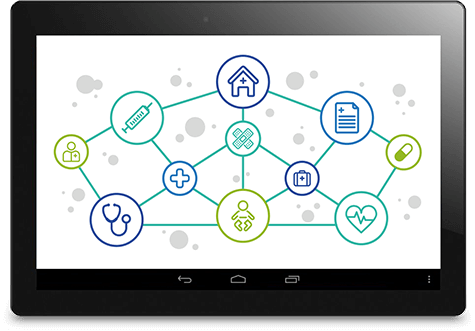 Allow frontline workers to search, retrieve and update records from their assigned caseload, even when offline. Automated data synchronisation with the backend prevents data loss and ensures everyone working on a case has the most current data available. Enable case collaboration by allowing controlled data sharing between authorised users. Team members need to be able to communicate effectively with one another. Direct supervision is generally impractical and teams often turn to external messaging apps which lack centralised administration and don't allow conversations to be contextually linked to team activities. Use push notifications to alert users to new content, tasks, critical events and reminders. 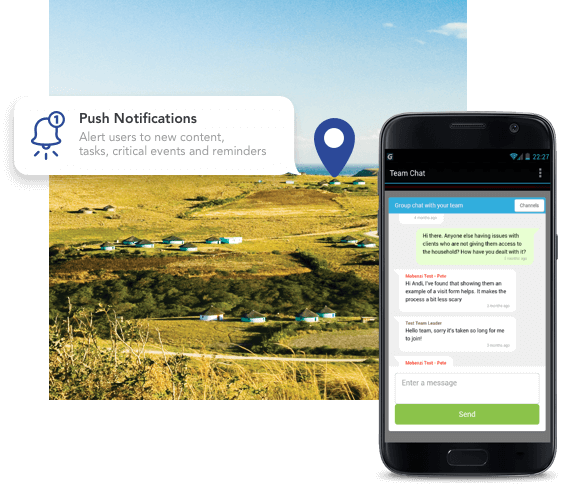 Embed secure, contextual instant messaging channels inside your application to enable real-time conversations between team members. Scheduling visits, keeping track of follow-up activities and interpreting standard operating procedures are just a few of the responsibilities frontline workers are encumbered with. Embed tools into your application to automate decision-support algorithms and ensure field teams execute the correct procedures and best practice. 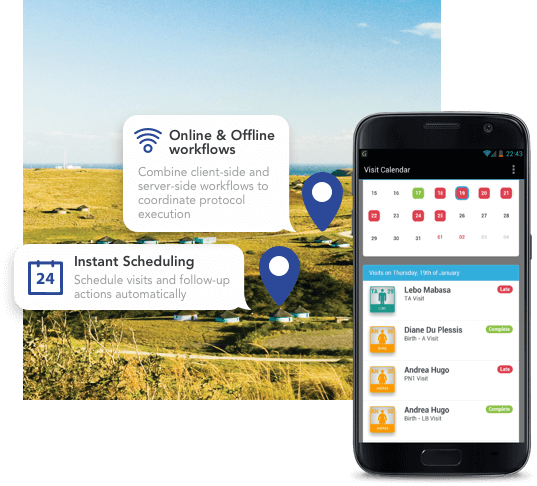 Support frontline workers with an interactive diary which populates based on pre-defined schedules, prompts for follow-up when appopriate, and updates automatically as tasks are completed. Facilitate long-running, multi-step processes which typically characterise longitudinal research, patient referral, pregnancy tracking and most other activities. Being able to uniquely identify a community member is one of the biggest barriers to scaling, monitoring and measuring interventions. Integrate fingerprint biometrics into your solution using the Mobenzi ID plugin and a standard fingerprint scanner. Enrol beneficiaries, research respondents or clients using their fingerprints and match offline at follow-up to confirm identiy for data linkage and to ensure services are rendered to the correct individual. Activate biometric security to restrict access to sensitive information stored on a frontline worker's device. In some instances, it's simply more convenient to use paper as proof or confirmation of a transaction. It may also be important to leave a paper trail for regulatory or audit purposes. In communities with limited exposure to technology, a physical record can help secure buy-in and confidence. 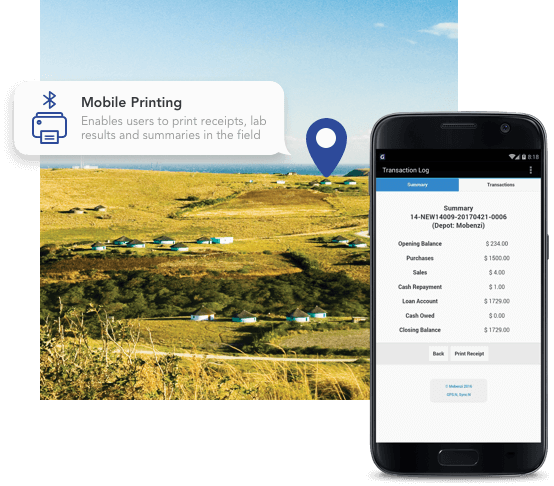 Integrate mobile printing capabilities into your solution using the Mobenzi IO plugin. Connect a supported Bluetooth printer to print receipts, lab results or any other content - right in the field. Supervisors require visibility on field operations to effectively manage, report on and optimise resource utilisation. Researchers and data managers need control over data collection instruments and the ability to analyse data to produce insights. The Mobenzi Web Platforms encompass generic reporting and self-service data management tools which can be enhanced with bespoke dashboards and web interfaces to produce complete information systems. Where necessary, integration with third-party systems is enabled via flexible APIs. The Mobenzi Researcher web backend provides a hub for centralised data management operations. An intuitive drag 'n drop designer makes form and survey design a breeze. 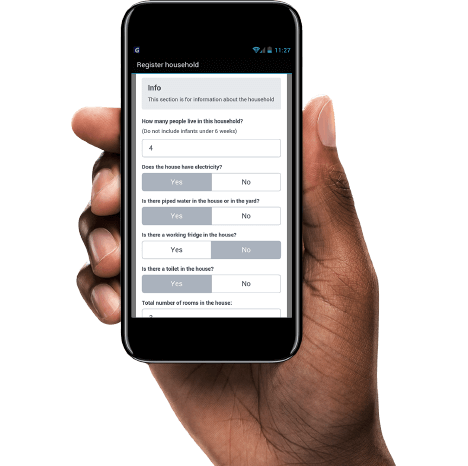 Advanced inputs, validation and logic flow control make easy work of even the most complex questionnaires. Powerful filtering capabilities allow data captured using the Mobenzi Researcher mobile plugin to be charted, mapped and exported in real-time. 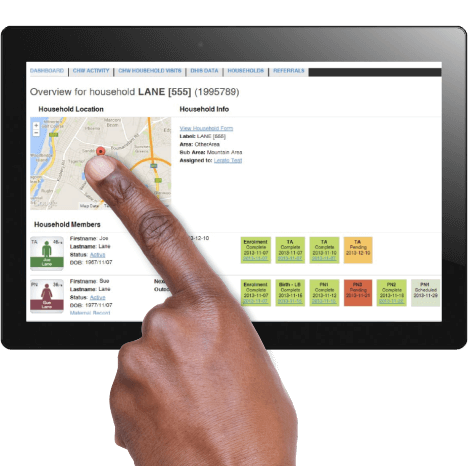 Fieldworker management tools provide oversight of operations and insight into fieldworker performance. Large-scale and complex programmes often require longitudinal reporting, indicator tracking and multiple levels of data aggregation. With little or no information being fed back to frontline teams, resistance to data collection manifests, limiting opportunities for data-driven improvement. The Mobenzi Web Platforms incorporate building blocks which support the implementation of a bespoke Management Information System. Interfaces can be exposed via web or mobile channels. Our team can work with you to configure the permissions, data models and interfaces necessary to deliver relevant and valuable information to supervisors, researchers and funders. 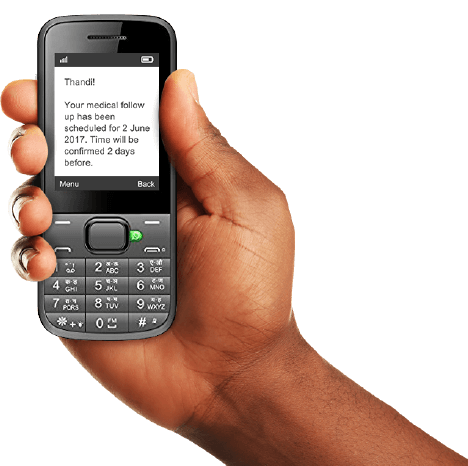 We're proud to be a contributor to the ICT4D ecosystem. Our platforms are standards-based and highly interoperable enabling integration with other tools, platforms and applications - both on the mobile and back-end. 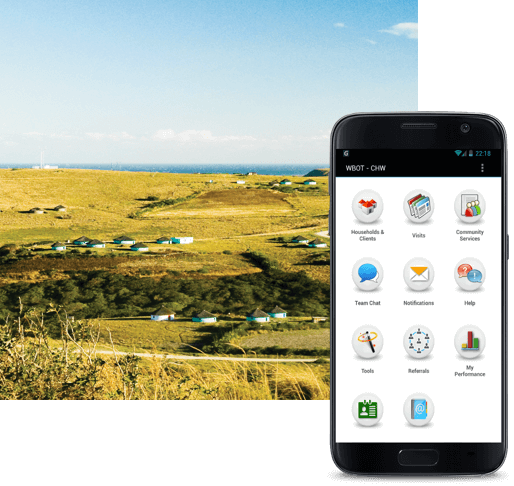 Many of the mHealth solutions we have implemented integrate with and enhance legacy data management systems (such as DHIS), national initiatives (such as MomConnect in South Africa) and national laboratory systems. We have extensive experience interacting with OpenHIE interfaces using modern data exchange standards such as FHIR. Design forms yourself in minutes. Supports offline data entry, including real-time validation and advanced inputs. Embed algorithms & decision-support tools to guide frontline workers. Prevent handset misuse by limiting access to only the apps you approve. 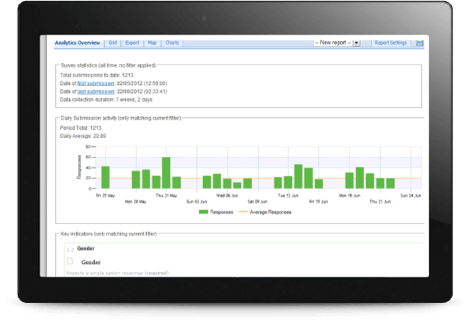 Avoid costly downtime caused by fieldworkers tampering with settings. Push notification & SMS support for alerts and notifications. Full data edit audit history. Fieldworker management & performance reporting. Chart, map and export data captured. Leverage powerful filters to create & share insights. Standards-based data exchange protocols and flexible APIs. Download our data management white paper to see how we leverage world class infrastructure and industry best practice to protect your data. Ready to digitise your fieldwork? Hundreds of organisations like yours have transitioned from paper to digital fieldwork using our easy-to-use platform. If your organisation is embarking on the development of a bespoke mobile solution for large-scale deployment, we'd love to hear about it. We typically engage in an agile fashion and work collaboratively to the available budget to craft a solution which maximises value and impact. Please feel free to contact us for further information or pay us a visit - we promise good coffee and inspiring views of Table Mountain.